Uma Incrocci as Ariel. Lucy Gellman Photos. Prospero is ready to roll. This anger has been simmering beneath her skin for far too long; now it is almost hot to the touch. When she raises her arms, the rain and the wind obey, spinning their gusts into song. Sailors scatter as their ship is wrecked, and the waves rise ever higher. 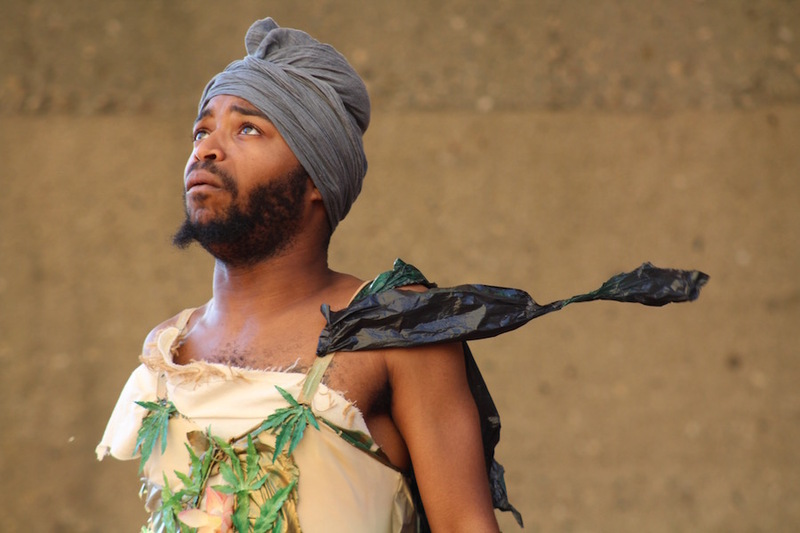 So begins Connecticut Free Shakespeare’s The Tempest, running July 19 to 22 at the University of Bridgeport. 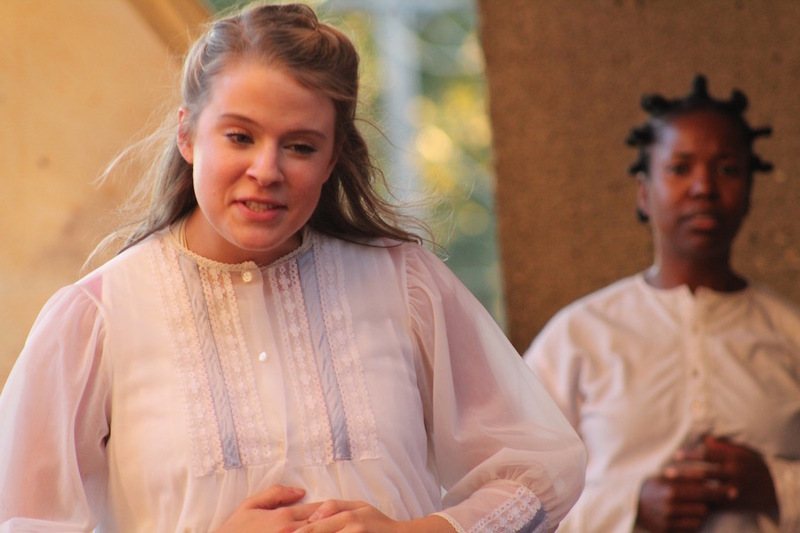 A project of Dandelion Productions, the adaptation drives home the play’s central question—is it better to let anger ferment and burst, or to forgive and forget?—with a new, urgent energy. 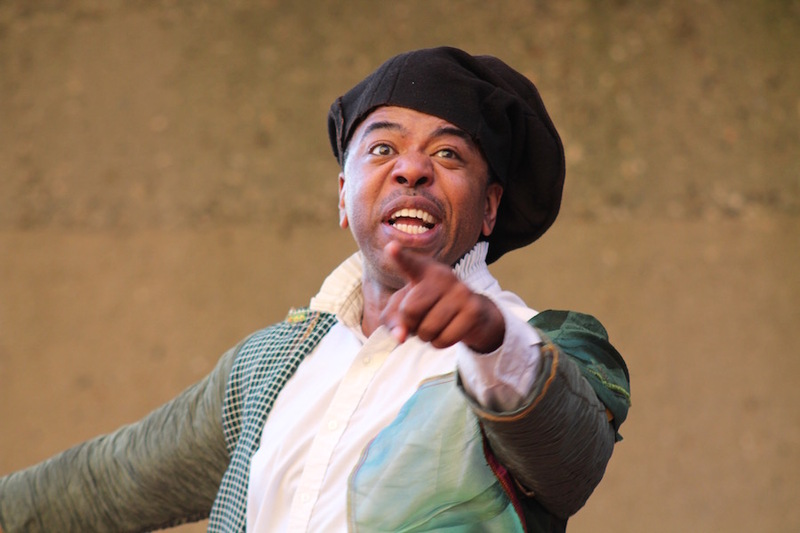 Written by William Shakespeare in the first quarter of the 17th century, The Tempest tells the story of Prospero (Channie Waites), an island sorcerer whose power is fueled largely by his rage. He has cause for the anger: his brother Antonio (Mark Friedlander) left him stranded at sea with his 3-year-old daughter Miranda (Alex Acosta), and Prospero has never escaped the island where they washed ashore. Now several years later, he has tools at his disposal: the wispy Ariel (Uma Incrocci) and reptilian swamp thing Caliban (a prodigiously talented Myles Tripp), stuck in his ownership until he officially frees them. So when he has a chance to wreak havoc on a ship that carries his brother and the King of Naples, they get to work. Shakespearian plot machinations unfold around them: people fall in love, are put under spells, and become amazed when they can see eye-to-eye with people from foreign lands. Sounds kind of familiar, no? But this Prospero is a woman. She brings the storm because she is, perhaps, the storm itself. It’s a small change that triggers both a semantic shift—father to mother of now-adolescent Miranda—and an emotional one. Prospero’s rage is more acute; her power more awesome. Before her brother wronged her, we can assume that the world may have, too. Every move she makes is a swift and shrewd punch to the gut, a breath caught in one’s throat. As this Prospero, actor Channie Waites is a dynamo. From the moment she sweeps the stage in a long, hole-riddled cloak, puffy white garments and dark wood wand, she is mesmerizing, with a nuanced understanding of the language. Shakespeare’s words fly off her tongue with sparks on their edges, singe the sides of the stage. “Vengeance is in my heart,” she declares to the audience early on, her eyes wide and gleaming. No one knows of quite how much she’s capable. 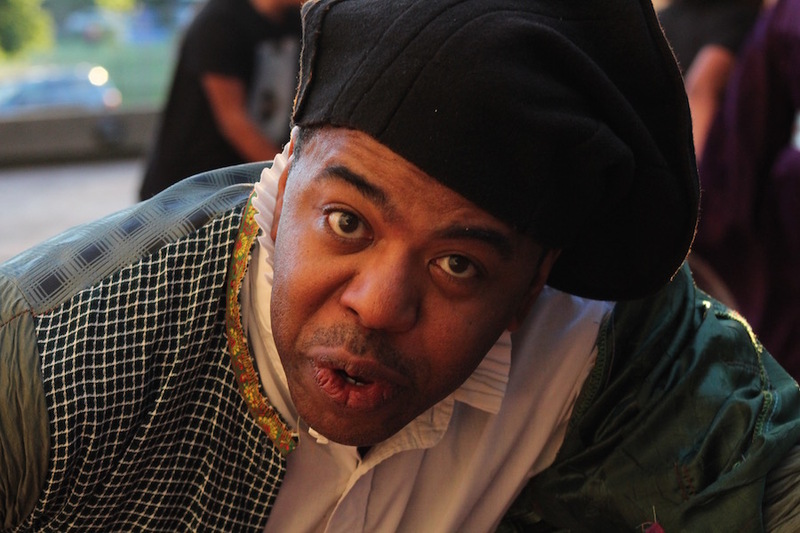 As King Alonso, Craig Anthony Bannister gives the audience a sadness that is engulfing when he thinks he has lost his child, and a joy that’s equally contagious when he realizes he has not. Alex Acosta and Joel Oramas are spot-on as hot and bothered Miranda and Ferdinand, punch-drunk on their love as they run across the stage, then fold to Prospero’s every demand. Acosta in particular holds a deep sense of the character, as if she has been Miranda’s past and future, and knows that she will be okay if she just keeps being herself. And then there is our swamp thing. Mills as Caliban is propulsive and magnetic, of another world entirely as sea moss drips and blows from his body. With a costume of long plastic threads, climbing ivy, and webbed reptilian feet and hands, you don’t know if it is for good or evil or whence it came, only that it’s here and gripping. You root for him because he has been ground down by those around him, kept at arm’s length for his difference. It is he, often, who breaks the fourth wall to subtly let the audience know what is going on. This Tempest is, to its great strength, accessible without ever being cloying. 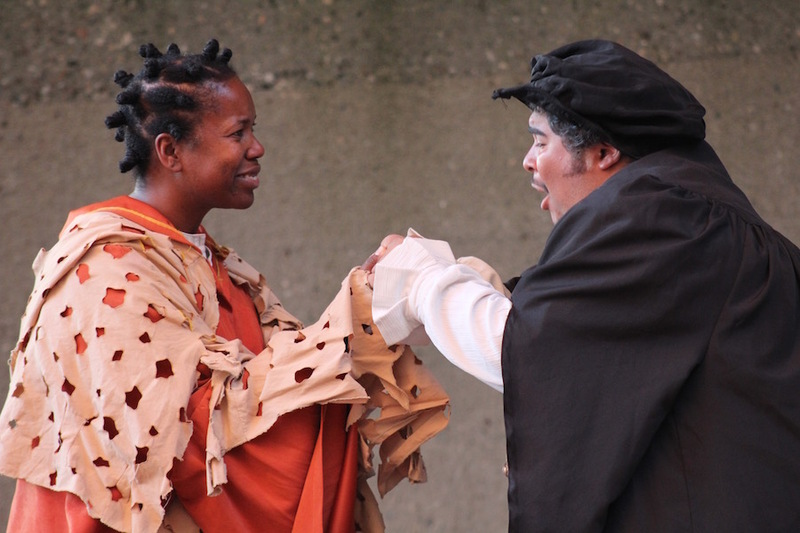 Characters blow the dust and cobwebs from Early Modern history to show how infinitely relatable Shakespeare can be—then are careful as they add interpretation. Indeed, everything about this performance is intentional. 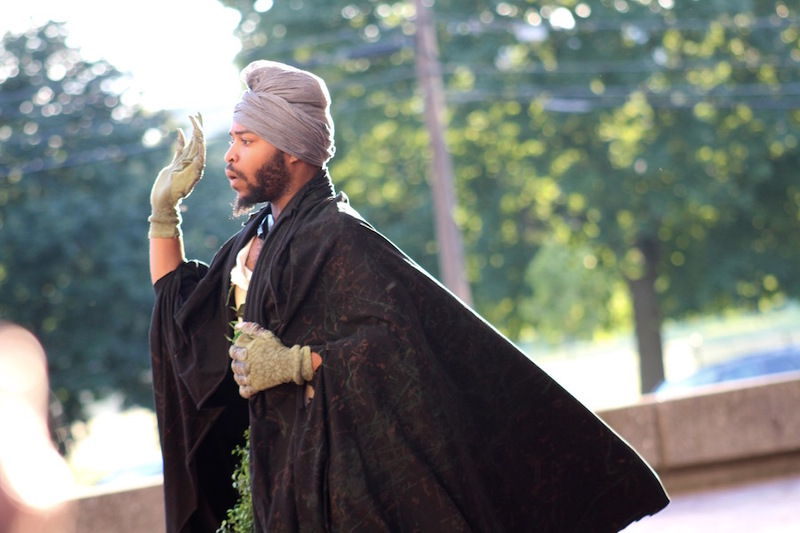 Set outside the university’s Arnold Bernhard Arts & Humanities Center, the set is relatively minimal, leaving actors to do the work of bringing this world to life. They have a road map: painted and stacked milk crates, a thick coil of rope suggesting where the stage might begin, a small army of fabulous puppets and masks that make the ensemble seem much larger than it is. But they are left with the words of the Bard to do the rest, and they put their trust in their power. The schmaltziest it gets is a “living intermission” for which the company has become known, which becomes so much fun it almost seems not gratuitous. It is Shakespeare as it feels it was meant to be—with the inevitable passing of time. Car alarms, passing dirt bikes, soccer players and neighbors walking their dogs all become part of the play’s fabric, absorbed into its score without ever asking permission. By the final bows, you want to see it again. Around the stage, warm wind picks up. You feel as if you too could be swept out to sea. And you know, even before the smell of salt comes of the water, that you must let it take you. 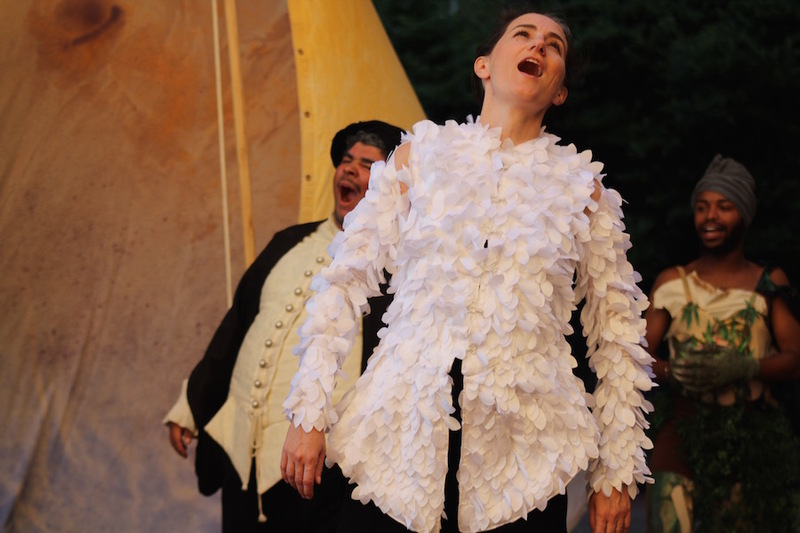 Connecticut Free Shakespeare’s performance of The Tempest runs at the Arnold Bernhard Arts & Humanities Center at the University of Bridgeport from July 19-22. All performances begin at 6:30 p.m. and all are free and open to the public. For more information, visit the company’s website. For a photo gallery from the show, click through the images below.